Looking for a mind altering experience? Then come experience Sykesville, MD where white oak trees are in abundance and beautiful; and the community is rich in history. 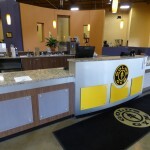 Here you will also find the Sykesville Gold’s Gym where you can experience a great workout with a personal trainer and enjoy a refreshing protein shake from the juice bar. 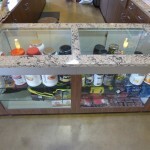 This high end fitness center cabinetry was completed by Creative Surfaces. Our custom commercial cabinetry products are created to be visually thrilling with exquisite artistry and custom built by our team of experienced craftsmen. Creative Surfaces is one of the top companies in the United States that manufactures and installs all of our own custom casework and millwork projects. No project is too big or too small. 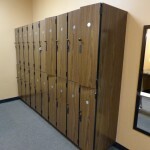 Give us a call and let us assist you on your next custom commercial cabinetry project.